I am in the crafting mood! lol. Seems like I just can't get enough crafts done this week. Today, I made some more Primitive Easter Eggs for my local craft booth. If you'd like to make some adorable Easter eggs in the prim style, here's how I done it. I started out with some plain, brownish crafting eggs. They look like this and I buy them in bulk packages of 40. Then, I paint on a first coat in an acrylic color. Then on a few, I dry brushed on a few streaks of another color, to give it a more prim look. I stick with base colors such as greens, browns and reds. Then, to add a country look. I load a toothbrush with some off white and fling little dots of color all over some. This was a great tip I still recall from my high school art teacher! Next I draw on my sayings consisting of, "fresh eggs, free range, 5 cents, ect." Or I will stencil on some stars using my Delta stencil paint. And then let all that dry. And finally, all that is left to do is match them up in sets of two, package them in a cello bag and tie them off with a bit of homespun fabric. And wa~la. Here's some cute Primitive Easter Eggs ready to go into my craft booth at the Peddlers Mall. Here's some more pics of them finished. I don't know why I can't keep all my eggs in a basket. lol. Thank ya'll for stopping in. Yaay! they look great! I'm sure they'll sell well! Thanks Christine.I too thik they will with Easter approaching. I made other just "country themed" in the past and they sold out. Thanks for stopping by! Thanks much Moonlit Stitch! Drag your hotglue gun outta the drawer and put on ur crafting shoes. lol. Can't wait to see some new things you make! Thank you so much! 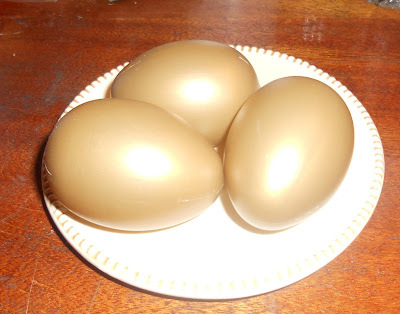 The wooden eggs, I'm sure, would look awesome all dollied up! And I figured by the groupings of two, people could pick out their favorites to make a basket full. So far, so good. Thanks again! I love Easter, I'm addicted to the smell and taste of the chocolate. Your decorated eggs are wonderful, I usually do one window display for Easter and I'm going to use your idea. A window display for Easter sounds awesome! Have fun with the egg idea, it's super simple in the long run. You'll have to post or send me a pic of them when u get done!